Rosse Observatory MuseumDo you often find yourself gazing skywards; do you have a hankering for the heavens? If you’d like to experience the skies with celestially minded companions Carleton Community Centre at Pontefract is the place for you. Do you often find yourself gazing skywards; do you have a hankering for the heavens? If you’d like to experience the skies with celestially minded companions Carleton Community Centre at Pontefract is the place for you. 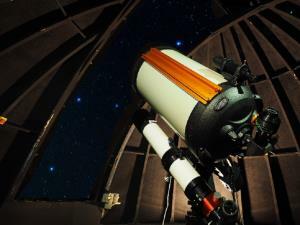 The team at the observatory are the proud owners of telescopes that will transport you through the galaxy to the stars beyond. Officially opened by the late Sir Patrick Moore in the 70s the team aim to educate and encourage anyone who has a love for all things luminous. Everyone is welcome to attend Members Night on Tuesday evenings. West Yorkshire Astronomical Society really does have a passion for bringing the heavenly bodies to the community and closer to you. Open all year - winter evenings best for stars, summer evenings for solar & cloud. Please note the observatory is closed all August for essential yearly maintenance. Public Open Evening, Members Talks, Astro News night - members £2, visitors £3. Guest Speaker Evening (professional scientists) members £3, visitors £4. Membership Rates - Adults £35 , Family £50 . Group Visits - Donation - suggested minimum £1 per person. Take Junct 32 off the M62 and follow signs for the centre of Pontefract (A639). At the junction with the A645 (Southgate) continue straight over onto the A639 (Mill Hill Road). Take left fork onto Carleton Road andtravel for about 0.5 miles. Carleton Community Centre and the Rosse Observatory are on the right hand side. The Rosse Observatory is indicated with a "Highways Sign" on Carleton Road.